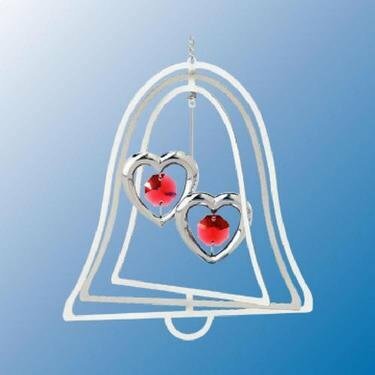 This Chrome Plated Twin Hearts Bell Ornament features Austrian Swarovski Crystal. The design is 3.75″ x 3.5″ x 3.5″. This is an Original Crystal Delight ornament! Wow!!! This is the finishing touch to just about any room in your home! Swarovski Crystals sparkle beautifully against the light. This is just gorgeous and absolutely the perfect gift for newlyweds or the romantic in your life!